This was one of the Kidstory Series, six interactive storybooks for children that were intended to be affordable for customers, while retaining good quality. The publisher was a Packard Bell company and sold its computer products such as personal computers with a CD pack that contained several of these titles. This one is a story by Marcia K Vaughan about a town that has become overrun by mice. 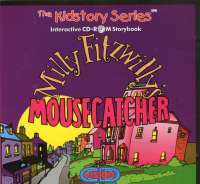 The story focuses on a woman who designs very elaborate mouse traps. Features: have the story read to you; click and play; jigsaws; print pages; find the hidden word game.